Black beans and rice is a staple Mexican side dish but this version is a far cry from the greasy beans and white rice you’ll find in most Mexican restaurants. Brown rice is swapped for the white and contributes a satisfying nutty flavor to the dish. It can also help reduce bad cholesterol and is rich in manganese, which is essential for bone health. Black beans are little powerhouses with their high fiber, protein, and strong antioxidant properties. Here they’re simmered with onions, vitamin-rich bell peppers, and a savory blend of spices. The addition of lean chicken breasts, roasted with heart-healthy canola oil and shredded, is what really makes this dish a meal. Everything is finished off with a bright and simple apple salsa that elevates this typically “ordinary” side dish to culinary status. Combine brown rice and 2 c. chicken broth in a medium saucepan. Cover with a lid and bring to a boil. Reduce heat to low and simmer, covered, for 45 minutes. Remove from heat and fluff with a fork.Rub 1 tbsp. canola oil over chicken breasts and season with salt and pepper. Roast in the oven until cooked through, about 20 minutes. Let cool slightly and shred with forks. Meanwhile, heat remaining tablespoon of canola oil over medium high heat. Add red onion and peppers and cook until softened, 6-7 minutes. Add garlic, chili powder, coriander, and cumin and stir for a minute or two. Add remaining 2 cups of chicken broth and the black beans and bring to a boil. Simmer uncovered about 15 minutes, until slightly thickened. Season mixture with salt and pepper. In a small bowl, combine apple, parsley, shallot, and lime juice. Stir together and season with salt and pepper. 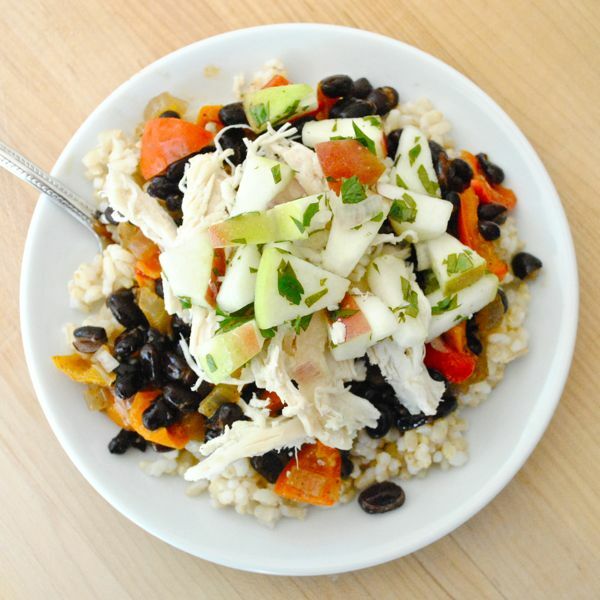 Layer rice, beans, chicken, and apple salsa on plates and serve! Optional additions – if you like cilantro you can substitute 2 tbsp. of it for the parsley. If you like a little heat, mince a jalapeno pepper and add it to the apple salsa.